Mullah Fazlullah, a senior leader in the Movement of the Taliban in Pakistan, has claimed credit for the assassination of a senior Pakistani Army general in a roadside bombing in the northwestern district of Dir last month. 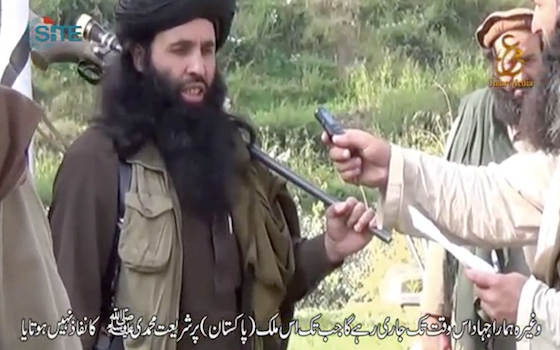 Fazlullah appeared in an official Taliban video, which also showed footage of the attack on the general’s vehicle. The videotape was released on Sept. 29 on the Facebook page of Umar Media, the official propaganda arm of the Movement of the Taliban in Pakistan, and was obtained and translated by the SITE Intelligence Group. The video features an interview with Fazlullah and details the Sept. 15 IED attack that killed Major General Sanaullah Niazi, the commander of Pakistani Army troops in Swat, along with a lieutenant colonel who commanded the 33 Baloch Regiment, and a soldier. The Long War Journal noted on the day of the attack that Fazlullah had very likely orchestrated it. A Taliban video crew captured the IED blast that killed the Pakistani Army general. A military vehicle is seen traveling along a road on the side of a mountain when it is hit with a massive blast. The vehicle explodes and then careens down the mountainside. Fazlullah, who leads the Taliban in Swat and the greater Malakand Division, an administrative area in northwestern Pakistan, is then interviewed and discusses the killing of Niazi as well as the prospects for peace with the Pakistani government. He says the Pakistani general was killed to avenge the death of Sheikh Waliullah Kabalgrami, Fazlullah’s mentor and a leader in the Tehrik-e-Nifaz-e-Shariat-e-Mohammed [TNSM or the Movement for the Enforcement of Mohammed’s Law], a Taliban group in northwestern Pakistan. Kabalgrami died in custody after being rounded up by Pakistani security forces during an operation in the northwest to free Swat that began in 2009. Fazlullah also notes that his forces killed another Pakistani general, and that their ultimate target is General Ashfaq Kayani, Pakistan’s Chief of Army Staff, the top military commander in the country. “Our target is Kayani and the Core Commander, and, Allah willing, we will attack them. We are working on it,” Fazlullah continues. Fazlullah also addresses the issue of negotiating with the Pakistani government, and makes it clear that the Taliban will not accept anything short of sharia, or Islamic law, and the end of any form of democratic government. “The government of Pakistan is enslaved and is not autonomous. In the past, it has not abided by a single peace agreement,” he says, claiming that the Pakistani government failed to live up to prior peace deals which put the Taliban in control of vast areas of northwestern Pakistan. Fazlullah, who is also known as Mullah Radio for his radical sermons broadcast throughout the northwest, ranks among the top leaders of the Movement of the Taliban in Pakistan. He has vowed to continue the fight to regain control of Swat and the surrounding districts. He is one of the most extreme commanders in a group filled with extremists. He was one of the first leaders to have opposed polio vaccinations. Last year, he proudly ordered the assassination of Malala Yousufzai, the young schoolgirl who passionately spoke out against the Taliban in Swat, and accused her of violating sharia, or Islamic law. Fazlullah is also closely tied to al Qaeda. When he openly ruled Swat from 2007 to 2009, he said al Qaeda fighters were welcome there and that training camps were in operation. One of his top deputies, Ibn Amin, also served as a leader of one of six known brigades in al Qaeda’s Lashkar-al-Zil, or Shadow Army. Amin was killed in a US drone strike in Khyber in December 2007.